Interested in increasing your café or restaurant’s appeal throughout the colder months? Coolabah Shades are happy to provide café blinds to Melbourne businesses as a means of retaining heat, blocking wind and protecting your customers from harsh winter rain or hot summer sun. 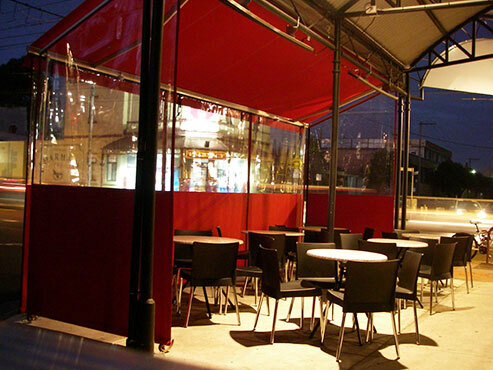 With café outdoor blinds, you instantly increase the appeal of your café or restaurant to potential customers. Made with insulating PVC sheeting, our café blinds are a smart, cost-effective and attractive answer to wet and stormy weather. Functionally extending the interior of your café or restaurant outside, we offer café blinds to Melbourne business owners as a proactive solution to the waning winter market. Clear PVC plastic provides this protection without obstructing outdoor views. The result is more space used for more of the year – Coolabah Shades is happy to offer the sound investment of café blinds Melbourne business-owners are after. With Melbourne being the city of alfresco café culture and coffee, it only makes sense to ensure your business has cafe style roller blinds. Coming in an alternate, UV stabilized tinted model, cafe blinds can be just as valuable during the summer months. With Coolabah Shades café blinds, Melbourne’s harsh UV index can be reduced for customers using your outdoor seating areas. Like sunglasses or window tinting, our tinted blinds take the edge off harsh, direct sunlight without blocking out views. Helping to keep your patrons both cool and free from sunburn, this is the kind of investment that turns café customers into café regulars. Our range of bistro blinds in Melbourne can transform the look of your café, and are easy to operate. With a low impact look and the option to choose unobtrusive crank-operated, motorized or pulley units, along with powder coating colours to suits your outdoor area, our blinds can be styled to match the visual aesthetic of your outdoor serving area. While we quote you for café blinds, we’re happy to discuss any additional queries about shade or shelter solutions you have, including window canopy or sail shades options, along with sign-writing on our products to maximize recognition and brand awareness. Although we’re known for our premium café blinds, Melbourne store-owners often find they want to take advantage of a number of our shade solutions together. If you’re interested in seeing if our cafe style roller blinds are for you, feel free to call us for one of our obligation-free measure and quotes. Our trained team are equipped with the qualifications and know-how to provide the cafe blinds Melbourne restauranteurs are talking about. We’re happy to talk you through each stage of your renovations, from planning to installation. With experience in fitting countless Melbourne cafes out with premium blinds, our team can offer invaluable insight into finding the right shade and shelter solution for you.